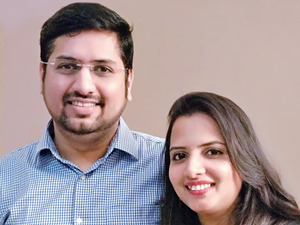 Shrikar, 37, and Shrutika Dange, 35, are IT professionals and bring in a combined monthly income of Rs 2.6 lakh. They live in their own house worth Rs 1.1 crore, for which they have taken a loan of Rs 67 lakh and are paying an EMI of Rs 80,000. Their goalsinclude building an emergency corpus, saving for their future child’s education and wedding, buying a car and another house, taking a vacation, and saving for retirement. 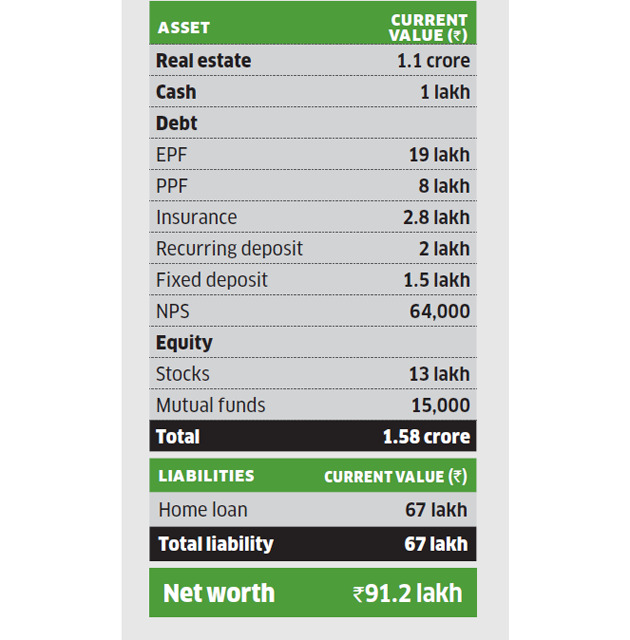 Though they have a high amount of surplus and have saved aggressively, Financial Planner Pankaaj Maalde suggests they put off buying another house and taking a vacation for now, and focus only on their primary goals. To start with, they can build the emergency fund of Rs 5.58 lakh, which is equal to their three months’ expenses. 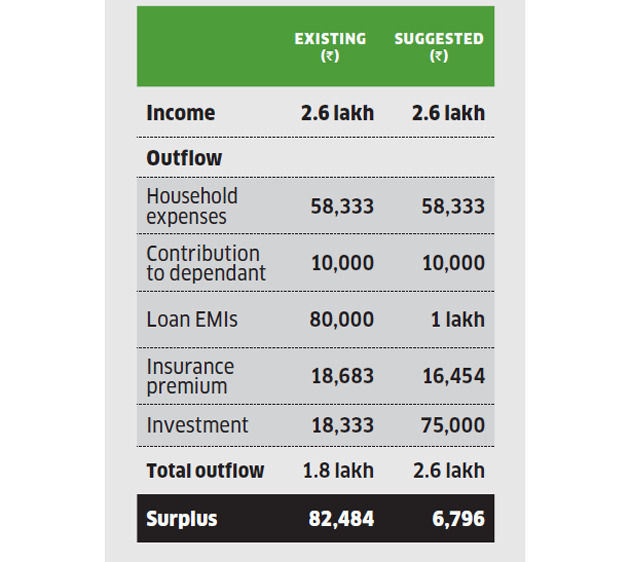 For this, they can allocate their cash (Rs 1 lakh), fixed deposit (Rs 1.5 lakh), recurring deposit (Rs 2 lakh) and insurance surrender value (Rs 2.8 lakh), and invest it in a short-duration debt fund. For their future child’s education in 18 years, they need Rs 3.4 crore and can build it by starting an SIP of Rs 45,000 in a diversified equity fund. To amass Rs 5.5 crore for the kid’s wedding in 25 years, they will have to start an SIP of Rs 27,000 in a diversified equity fund and Rs 3,000 in the gold bond scheme. For retirement in 23 years, they will need Rs 7.3 crore and can assign their EPF, PPF and NPS corpuses, besides their stocks and Ulip. They should continue investing Rs 500 in the PPF, Rs 1 lakh in the Ulip and Rs 75,000 in the NPS every year. To buy a car worth Rs 10 lakh in a year, they can take a loan for five years and the EMI of Rs 21,250 can be sourced from the surplus. 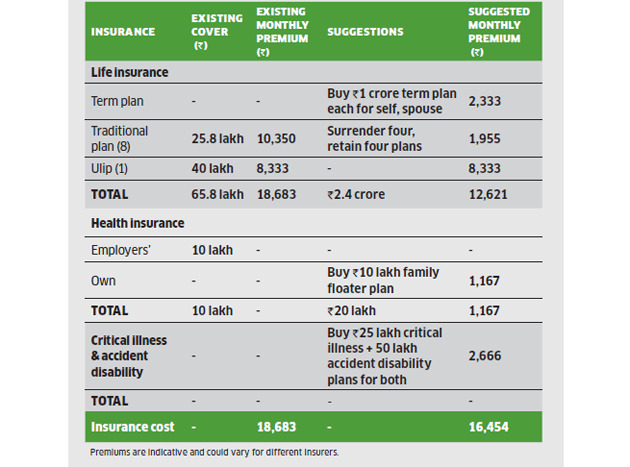 For life insurance, the couple has eight traditional plans and one Ulip, worth Rs 65.8 lakh. Maalde suggests they retain the Ulip and four traditional plans, but should surrender the remaining four plans. Both Shrikar and Shrutika should buy a Rs 1 crore term plan each, for a monthly premium of Rs 2,333. For health insurance, the couple has a Rs 10 lakh family floater plan provided by their employers. Maalde suggests they buy an independent family floater plan of Rs 10 lakh for Rs 1,167 a month. They should also buy a Rs 25 lakh critical illness plan each, and a Rs 50 lakh accident disability plan each, which will cost them Rs 2,666 a month in premium. This should take care of their insurance needs.